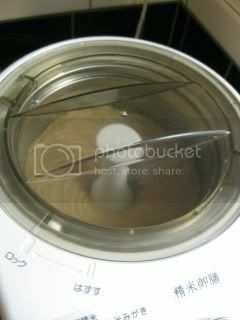 In my last trip back to Japan, I finally bought a rice polishing machine (精米機) and hand-carried all the way back to LA. This is the rice polisher. It's quite compact for what the machine can do for your rice. 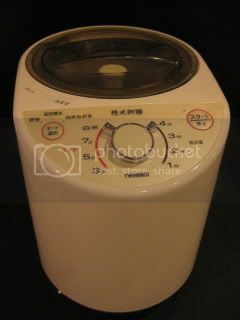 The size and weight are just about the same as a regular-size electric rice cooker. 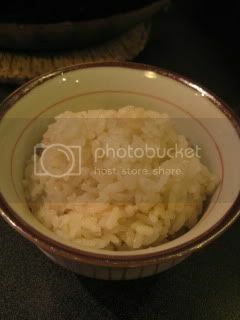 You can polish up to 4 rice-cup amount (about 720 ml or US 3 cups) of uncooked rice. 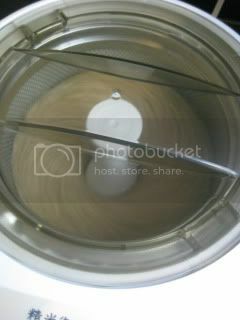 This is quite a smart machine, as you can change the rice polishing rate from very small to complete white rice level. 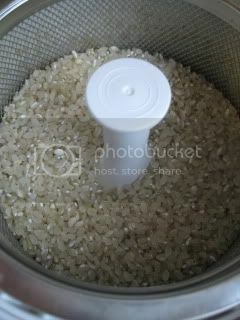 The very reason I purchased the rice polisher is because I WANTED TO EAT THE BEST QUALITY RICE EVERY DAY. 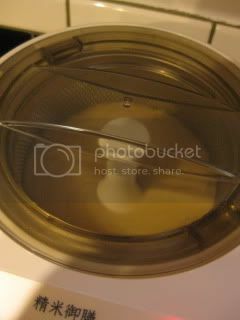 I have the best rice cooker, double-lid donabe rice cooker, "Kamado-san", and I thought I've been cooking high quality brand rice. However, it was only recently that I started to pay attention to the timing when the rice was polished. Whether it's white (rice bran is completely removed) or partially polished brown rice, from the moment rice is polished, it starts to oxidize from the surfaced fat content of the rice. The more time rice spends after polishing, the more advanced its oxidation progresses thus its flavor continues to deteriorate. So the already polished commercial rice actually has a very short shelf life. Eating oxidized rice doesn't only mean its flavor becomes far from optimal, but it's also less optimal for your health. So, for both flavor and health, rice is best eaten as soon as it's polished. 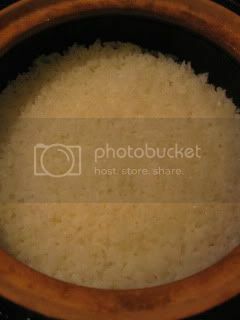 Even a regular inexpensive kind of rice can taste dramatically better if it's cooked shortly before it's polished. 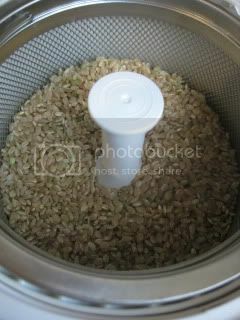 Also, for me, using rice polisher is by no means in order to remove the nutrients from the brown rice. Rather, I got it for my healthier living. I like only slightly polished brown rice, which is much easier to digest than whole brown rice, while it still contains most of the beneficial nutrients. 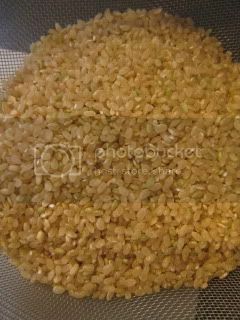 Another bonus is that slightly polished brown rice doesn't require long soaking time or cooking time. It can cook just like white rice. 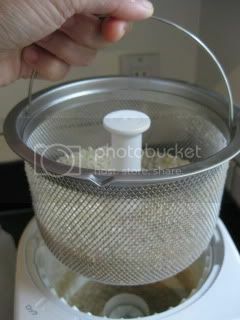 So, here's how my new rice polisher can work! 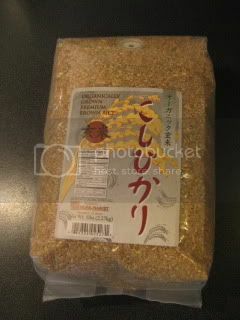 I got organic Koshihikari brown rice from Nijiya Market. You just set the rice into the machine, and choose the polishing rate. Cover and start it. The mill rotates really fast, and in just a minute or so, it's ready. This is 30% style (i.e. 30% of rice bran is polished away) rice. 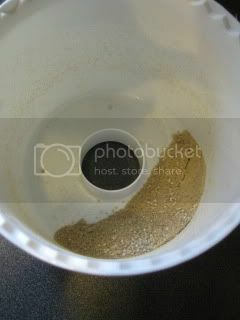 And the removed rice bran is left in the bottom case, so you can keep collecting it and use for making nukazuke pickles base, fertilizing garden, or making facial packs! So, you won't waste any part of rice. 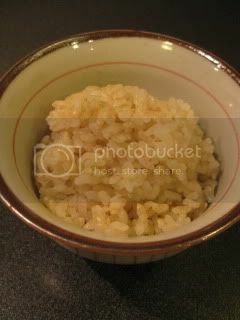 The freshly-polised 30% style brown rice, cooked in my donabe rice cooker, "Kamado-san". 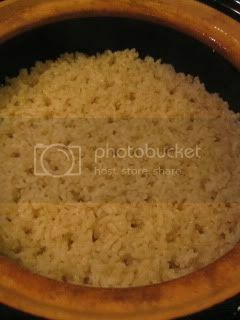 The rice is so shiny and the texture was beautifully chewy and simply amazing. Now, for white rice lovers. It's a complete white rice. So, all the bran was polished away. 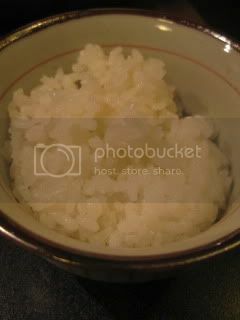 Wow, I've never seen white rice this shiny. It was really like small pearls. And the taste was so milky, fresh and chewy. And, here is my favorite, which is minimum polish style (just about 10% of bran is polished). 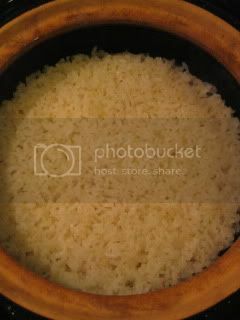 So, the polished rice is still very brown, but it can cook just like white rice. Voila, my ultimate slightly-polished brown rice. It's super amazing, and I wish everybody who read this could taste it!! The texture is perfectly bouncy-chewy, and the flavor is really rich. 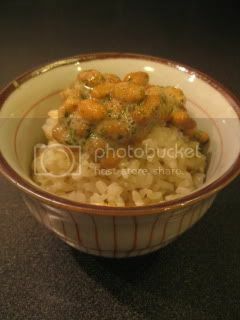 I also had this rice with my homemade natto (fermented soybeans), which was seasoned with my homemade irizake (cooked-down sake-based seasoning). Regardless the polishing rate, the freshly polished rice taste simply amazing...the best. 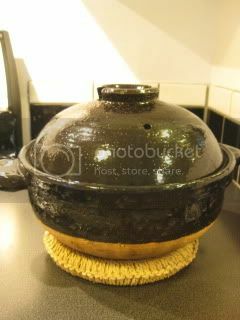 Now, I can't live without the rice polisher for my donabe rice. 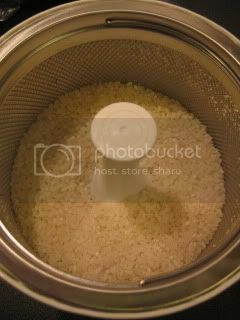 If you love rice, rice polisher is a must-have machine for your kitchen! Ultimate donabe rice dish, indeed.